It is rare that a program will announce that a feature is too good a movie to play in one of it's strands but that is pretty much the basis for Nor'easter's synopsis in official Bradford Film Festival literature. Readying the audience for "one of the most beautifully-shot films you will see this year", the suggestion is that writer/director Andrew Brotzman's debut cinematic outing is perhaps too well crafted a motion picture to be shown amongst "the rough diamonds from the hard-scrabble fringes of American cinema". Nor'easter is a highly innovative, majestically original movie which defies any types of label; attempting to schedule or describe it comes with a unique set of challenges. 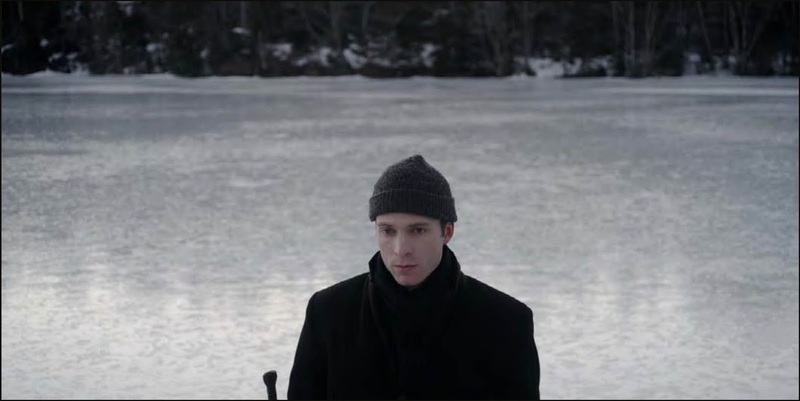 Whereas many indie films will consistently "break the fourth wall" and remind the audience the low budget, independent nature of the movie they are watching, Nor'easter steers clear of these tropes for the entirety of it's running time; eschewing shaky hand-held cameras, acoustic whimsy and mumbled "natural" acting, Brotzman's stunning feature consistently aims for, and achieves, something entirely more expansive.The closest I can come to describing what I witnessed in a short sentence is that it took the form of the type of motion picture I can imagine Terence Malick making if he ever has a theological crisis. Lensed exquisitely against a backdrop of sterile expanse, Brotzman's film aims to capitalise on the harsh climate of his birthplace Portland, Maine; a cold wind tugs at the corner of the frame at all times and the weather hints at bleak desolation, humans are held captive by the lack of clemency in the earth and heavens around them. Whilst on paper the setting may be in North America, for all intents and purposes the tale plays out in a hollow Pergutory - something which echoes the themes of this highly evocative piece of cinema. The tale centres around a rookie priest, Erik (David Call), who has been assigned to a remote, sparsely populated new parish. The congregation at his church consists of just three members and it is this small population which means that everybody in the locale knows everyone else and, indeed, their troubles. None are more pressing than the unresolved kidnapping of a small child some years prior. The nature of the case, investigated by a policeman who's wife had an affair with the previous clergyman assigned to the parish, is an on-going source of bitter resentment and tension amongst the townsfolk. Erik takes it upon himself to resolve this bubbling anger of the community and return faith to the town whilst hiding a troubling secret; his own belief in God is beginning to waver. In a very peculiar way Nor'easter, which UK premiered at Bradford Internation Film Festival, reminded me of the 1980s' classic The Neverending Story - both desolate features are haunted by emptiness; absolute nothingness eats away at the characters and threaten to engulf the entire worlds in which they reside. In Nor'easter it is this aspect which makes the film the visceral experience it is; it's a horror film where the central character is haunted not by ghostly apparitions but by the much more terrifying notion of nothingness. To return to the Terence Malick reference of earlier, the film is bound to gain some detractors as, for long stretches, straight forward narratives are cast aside in favour of what can only be described as "mood cinema" - but, for those who appreciate this style of movie-making Nor'easter is a real treat. Watching the feature is spell-binding. It's hard to imagine the film being made, assembled. Instead it seems to appear onscreen fully formed as if it was begotten or has been pulled, in its entirety, from a different astral plane entirely. Having observed this movie, I can confidently state that Andrew Brotzman is a film-maker with a remarkable career ahead of him; his debut is so seamless and so clear in vision it is alarming. Cinema has gained a unique voice and I cannot wait to see what he conjures up next. * This film screened as part of Bradford International Film Festival. I recommend checking out this fantastic review by Unsalted Popcorn for an alternative opinion too. Thanks Ged - you're very kind! I have seen this movie myself, at the Woodstock Festival in New York. It is amazing. I left the theater fully engaged by a well told story with layer on layer of intriguing complexity. I hope this young man is recognized for the talent he is. I think it would be impossible for someone so talented to stay secret for too long!